Title: 'Italiae Novissima Descriptio, Auctore Iacopo Gastaldo Pedemontano'. From the Theatrum Orbis Terrarum. 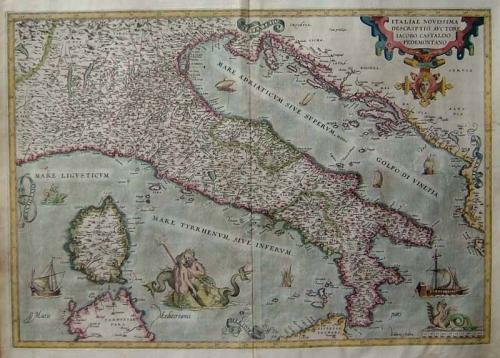 A beautiful map of Italy based on an earlier work done by Gastaldi. Features a vignette of Neptune and a female mermaid companion, sea monsters ships and decorative cartouches.